I recently flew out to Southern California to visit family. It’s great to get away from the cold and snow that is so typical of Upstate NY in February. Daytime temperatures here in California have been 75-80 degrees making it perfect riding weather. The last time I was out here, I had discovered some roads that are a bit off the beaten path but didn’t have time to fully explore them. So this time, I kind of knew were to go and decided to give these routes another try. 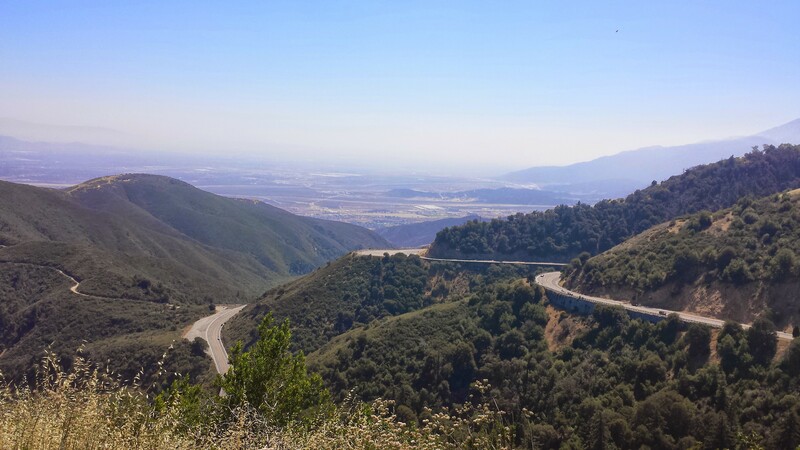 I rode up the Ortega Highway to a road called South Main Divide. This road starts out as a normal road but eventually turns into a single lane paved trail that meanders through the canyons. It’s a nice easy ride through some beautiful mountains. At the end of the South Main Divide trail, I found some nice easy dirt roads/trails to continue onto. There were some rutted sections but nothing that seemed too challenging. When I ran into a gate that prevented me from continuing, I stopped and had some lunch. On the return trip, I retraced my path. It’s amazing how much different the same road looks when going in the opposite direction. The afternoon shadows in the canyons made for some amazing views that were not visible earlier in the day. The ride was through the canyons around Malibu. I did have to spend some time on the freeway to get there and back, but it was worth it. The LA traffic wasn’t too bad and I’m becoming a bit more comfortable with lane splitting so even when things do slow down, I can keep moving and a reasonable pace. I got to Malibu at around 9:00 am and before heading into the canyons, I stopped at a Starbucks to get a cup of coffee. It was rather obvious that this is an upscale neighborhood by looking at the cars parked there. There was a black Bently coupe, a white Bently convertible, a couple of Audi’s, a Porsche, and various types of BMW cars and SUV’s. After my coffee stop, I started the good part of the day’s ride by heading up Latigo Canyon. From there, I turned on to Mulholland Highway and headed toward the Rock Store. From there, I turned around and took Encinal Canyon Road back down to the PCH. I went North on the PCH and turned on to Decker Road heaidng back into the canyons. I’m not exactly sure what roads I took once up in the canyons but I ended up on Yerba Buena Dr. at some point. 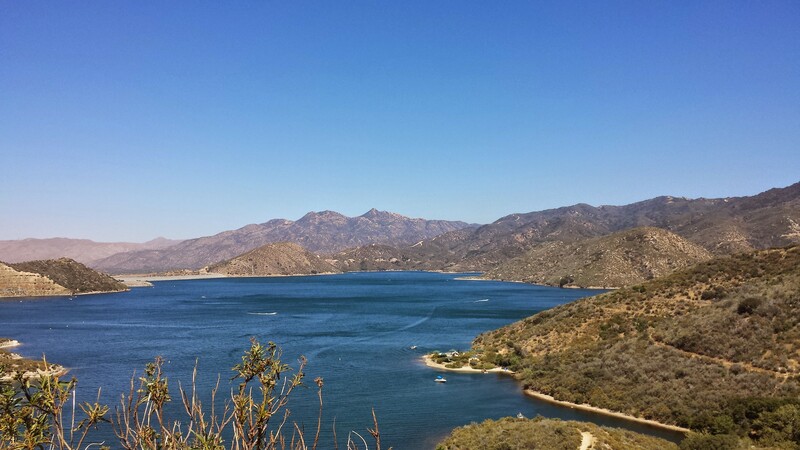 Yerba Buena Dr. is a bit beat up but has some spectacular scenery making it a road worthy of exploring. This road brought me back down to the PCH where I stopped at Neptune’s Nest for a fried seafood lunch. The PCH north of Yerba Buena Dr. was closed off for some reason so after lunch, I headed south on the PCH and turned back onto Encinal Canyon Road to get back up to the Mulholland Highway. I continued on Mulholland, picked up the 101 near Woodland Hills and headed back home for the day. Perfect weather, and very few cars in the canyons make for a great day of riding. The canyon roads here in Southern California never disappoint. Just before going out to California this fall, I had purchased a GoPro camera to record some highlights of my rides. I haven’t figured out how to use it to its full potential yet and hope to get some more experience with it over the winter months so that I’m ready to capture some more interesting footage next summer. One of the things that surprised me the most about the GoPro was how well it did with audio. With the camera mounted to the handlebars on the Triumph and the crash bar on the Versys, I figured that wind noise would be a problem. However, it seems as if the camera does an excellent job of eliminating the wind noise leaving just the sound of the engine. I haven’t taken a lot of footage yet, but I did post a couple of short videos to YouTube recently. Video editing is another area where I need to get some experience. Right now, I can only manage to do the most basic things with Adobe Premier and hope to get a lot more experience during the snowy months here in the Northeast. On October 23, I took a nice day ride through the Angeles National Forest. I had intended to ride the Angeles Crest Highway but my plans changed when I stopped for gas in La Cañada Flintridge. After filling the Versys up with gas, I pulled off to the side next to some other bikes and went into the store to get a drink. I started chatting with the other riders and found out that they were locals who had taken the day off of work to go out for a ride. It was an interesting group of bikes these guys were riding. There was a Suzuki DRZ400SM, a Yamaha R6, a Yamaha V-Max, a BMW S1000RR, and a BMW Scooter. After talking to these guys for a little while, they invited me to tag a long with them for the day. 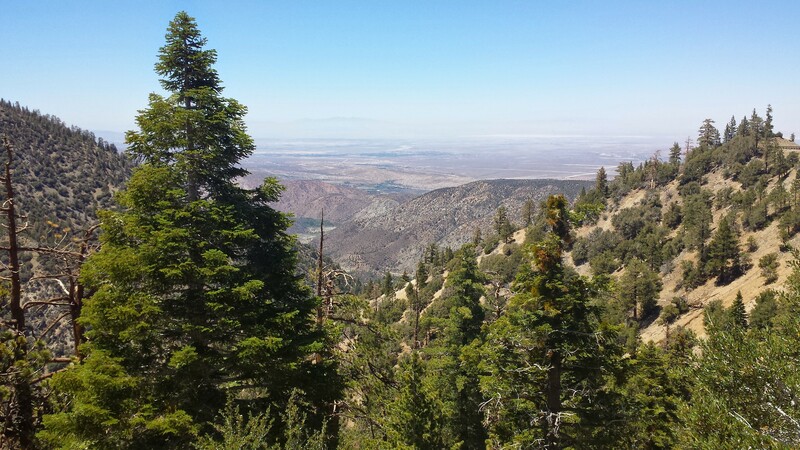 I had intended to go over the Angeles Crest Highway as I’ve done in the past but my new found friends were going to take some me om some less traveled back roads to Wrightwood. We started out by going up Rt. 2 but quickly turned off on to a road towards a place they called the “Big Tree”. After about 30 minutes, we pulled over and stopped. I found out that the Big Tree tree had been cut down years ago but this is where it used to be. After a nice 15 minute break, we took off towards some nice twisty roads. We continued through the mountains where there was virtually no traffic at all. 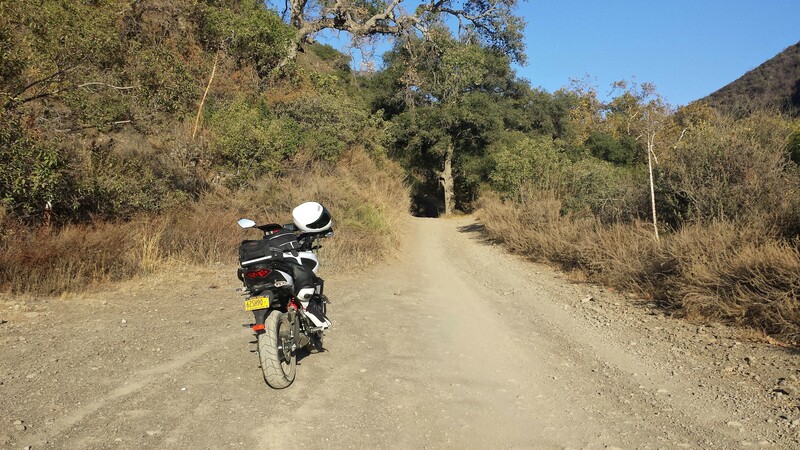 The roads were typical CA canyon roads – smooth, twisty, and fun to ride. Looking at a map now, I think we took Upper Big Tujunga Canyon Road to highway N3 but I’m not really sure exactly what route we actually took. I just know that we really weren’t on Rt. 3 for more than a few miles before stopping for lunch at the Grizzly Cafe in Wrightwood. I got to know my new friends a bit better and discovered that they’re all self employed and every so often, they take a day off and go out for a ride. After lunch, we headed out onto Rt 138 and then Rt 18 past Lake Arrowhead and into Big Bear. In Big Bear, we stopped at a coffee shop for a nice hot beverage. By this time it was around 4:30 so I decided that it was time to head back home. I said goodbye to my new found friends and headed back down Rt 18 and then on to Rt 330 to Loma Linda. From here I just took freeways back home. What a great ride. The weather was great and riding with locals allowed me to follow along on roads that I never would have ridden if I were out on my own for the day. I’m back out in California so I get to ride the Versys for a few days. The first order of business was to get some fresh tires and an oil change. I had a local shop install a set of Pirelli Scorpion Trail tires, clean and lube the chain, and do an oil change. I chose the Scorpion Trail tires because I want to start exploring some unpaved roads. Pirelli describes the tires as “Suited to Enduro motorcycles with a Touring setup, capable of tackling long journeys and excursions with light off road stretches”. It didn’t take long to get them scrubbed in and so far, they feel good on the street. I rode around a bit looking for some forest service roads to ride on but found them to be closed. 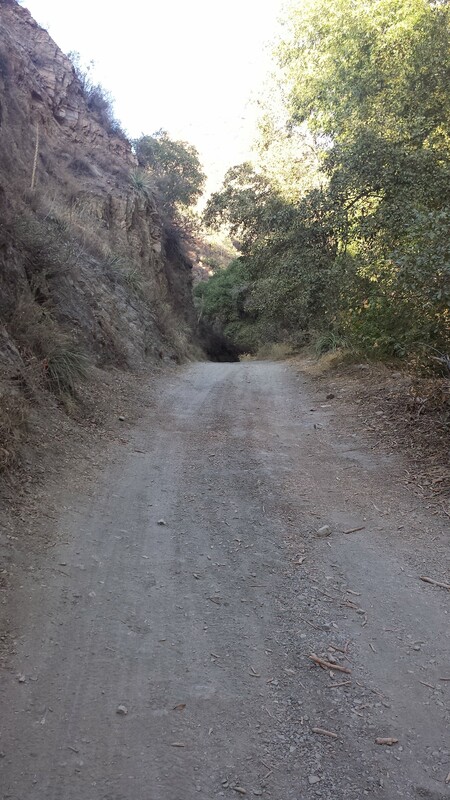 Eventually, I found a dirt road called Trabuco Creek Road that went off into the canyons. A mile or so up this road, I saw a guy stopped along the side of the road so I pulled up to say hello and try to find out a bit more about this road. He was riding a homemade bike with an old single cylinder 500cc dirt bike motor, a rigid frame, two solo seats (rider and passenger) and a bunch of parts salvaged from various other bikes. It was a great little bike. He assured me that that road was in pretty good shape and that I would have no trouble for the next few miles. Since I really haven’t spent much time riding in dirt, I just took it easy and went nice and slow. The road was pretty good with only a few small ruts making it a nice easy ride. Since it hasn’t rained here in months, it was a bit dusty and mud definitely wasn’t a factor. Since it was getting to be late in the afternoon I decided it was time to turn around and go back after going only about 3-4 miles into the canyon. The new tires seemed to handle this terrain just fine although just about any tire probably would have worked. 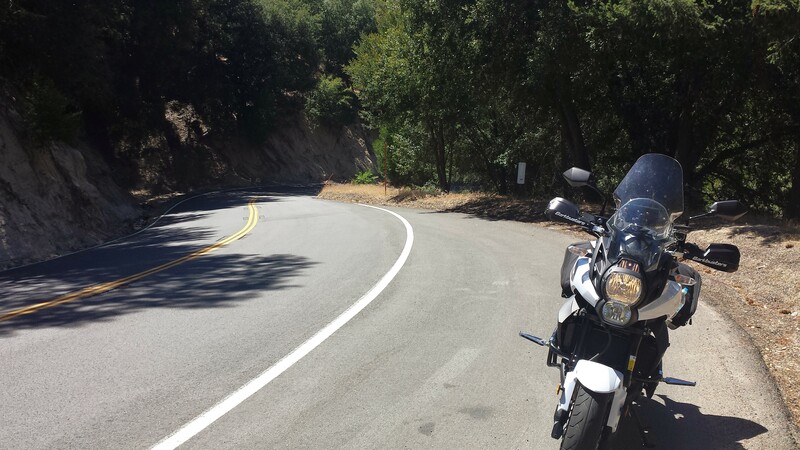 On Friday 6/13/14, I decided to finish my CA trip with a nice ride along the Angeles Crest Highway. I took the interstate highways through Pomona and Passadena to La Cañada Flintridge. I do believe that the Angeles Crest Highway is my favorite road of all time. The road is smooth with nice moderate corners making riding fun and exciting. About halfway along the road, I stopped at Newcombs Ranch for lunch.